I’m a sucker for Christmas. Sure, it’s become an overly commercialized, hopelessly hyped holiday — one that, Jon Stewart hilariously points out, has morphed from celebrating some guy’s “birthday,” on through “12 days,” and now threatens to gobble up Thanksgiving. But in many ways this is still the most won-der-ful time of the year. Warm gatherings ’round fires, brightly lit windows, wreaths up the wazoo — Westport glows and dazzles during December. Still, some of our celebrations can’t hold a candle to Christmases past. Back in the day — at least, this is how I dimly remember it — dozens of decorated trees stood atop Compo Shopping Center. In the middle of Main Street, Gene Hallowell lowered the hydraulic lifts at his downtown Mobil station. He covered them with tablecloths, cooked up meatballs and other comfort food, and hosted everyone for a day-long feast. You didn’t have to be a customer to share in the Hallowell holiday cheer. At least one downtown Christmas tradition remains. Tomorrow (Saturday), Staples’ Orphenians will carol downtown. Their joyful music more than makes up for the fact that Main Street has not yet fully recovered from Hurricane Sandy. George Weigle conducts the Orphenians on Main Street, circa 1981. If you want to see this great a cappella group, they start at 2 p.m. in front of Gene Hallowell’s old Mobil station. Or, as we now call it: Vineyard Vines. This entry was posted in Categories and tagged Compo Shopping Center, Staples Oprhenians, Vineyard Vines. Bookmark the permalink. Yep — a couple — one I’m not sure happened every Christmas but I remember more than a few. The first– every year, Saugatuck Elementary — the old one on Bridge Street with the large, wide front entrance steps, hosted a Christmas Carol sing for the entire school, their families and staff — seems like just regular neighborhood folks came too. All led by excellent music faculty only Westport would have. It was an exciting yearly event and we almost always had snowflakes flying, hot chocolate served and it was a tradition that one couldn’t miss — a great community event. 2nd – The Remarkable Book Store always seemed to have popular children’s authors in for Christmas book signings. You could go downtown after school, get some hot chocolate and stand in line or browse the store which was decked out for Christmas very well — after swim class at the Y. Seemed like a few years in a row, every girl child under the age of 12 in Westport was there standing in long lines for Joan Walsh Anglund’s autograph for “A Friend is Someone Who Likes You,” or “Love Is A Very Special Feeling” or “Christmas Is A Time Of Giving,” and to purchase the accompanying dolls. Still have those books and dolls, somewhat collector’s items now — my daughter had them for a few years and now I have them back. All happened at Christmastime in Westport — 1960’s- early 70’s. “some guys birthday”….his name was Jesus Christ! When George Weigle directed the Candlelight Concert, he’d come out onstage during the interval when the production number was being set up behind the curtain. He’d call for the house lights, and ask the audience to stand and get out their car keys. Then he’s lead us in Jingle Bells, with us jingling our keys. Little kids loved it. Adults smiled. And then we settled down for the always-entertaining production number. How about all the lit Christmas trees that used to line both sides of the Saugatuck River, All along Parker-Harding Plaza, Both sides of the Post Road Bridge, The rear of the Famous Artists Schools rear parking lot, and the parking lot adjacent to Klaffs.That used to be a beautiful sight. Yes, forgot about the trees on the bridge downtown. Trees at Christmas, flags on Memorial Day. The Christmas Walk occurred the week before Christmas in the 60’s. Main St would be closed to traffic (2 way at the time) and the cars were replaced by Roast Chestnut stands, hot cider and coffee booths, and Christmas Carolers strolling downtown. It occurred in the early evening and although all stores would be open, no selling was seen, the stores opened their doors to browsers and offered food and candy and lots of goodwill and cheer. From Pack Roads to Dorains to Kleins to Charles Market to Schaefers and Sport Mart, to the Townley Restaurant and West Lake it was a magical night where Westporters strolled almost like a scene from “It’s a Wonderful Life” and that made it the most wonderful time of year for the Stephens Family. I hope someone on the downtown merchants association reads this and revives the tradition- how wonderful!! Don’t forget the jewelry store near Oscar’s (whose name I can’t remember) famous for Christmas grog (and, of course, jewelry). Was that Swezey’s, with its fantastic model train display? Yes, it was Swezey’s. Thanks. Well, maybe they don’t beep their horns in your neighborhood but for some reason they beep in our’s throughout the year. This has gone on intermittently for years so it must be some sort of local behavior. I have no idea why. Sometimes there are double-beepbeeps and sometimes only one beep. Back in the day, where I lived at that time, mostly it was young drivers who beeped to say hi to friends walking along or as they passed by their friends’ homes. We don’t know the folks who beep now or why they do it. As to Christmas traditions, when we first moved here many people decorated their cars with wreaths on the front. It was festive. I don’t see that so much any more but the other day I saw a vehicle with faux horns attached to the front left and right roof, above the doors near the windshield. Santa always made an appearance at Bill’s Smoke Shop at Brooks Corner. My two children visited him there ! I loved the trees lining the river. Could see them from our house up the ridge above Wilton Rd. As for grog, my folks loved that too – think Ed Mitchell’s had it going on at the store which was near Saugatuck Congregational at the time. Changes crept in-retail went corporate and once Klein’s vaporized I began to refer to my one-time childhood home as Pottersville. Revive the Christmas Walk! I have often thought that Westport could and should have one when I visited Marblehead, Mass for theirs. I didnt know Westport ever had one, but boy would it be a HIT! 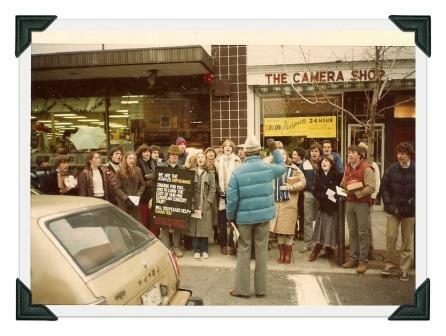 That is a picture of the Orphenians raising money for our trip to Europe in the summer of 1981. So that would have been Christmas 1980. Great memories, thanks. Nice shot of Klein’s, the site of some epic last minute Christmas shopping events. That was a great tradition. I am an Orphenian (active duty ’68-’70). I sang with Orphenians. Orphenians are friends of mine. There is nothing better than an Orphenian. And there is no better teacher than George Weigle. He may be equaled, but he will NEVER be surpassed!!!!! I liked the Westport Bank and Trust. They would bring in an organist for a few weeks. I miss EVERYTHING about Westport Bank & Trust!! !